Swiss teacher and editor; born at Endingen, canton Aargau, Switzerland, 1812; died at Zurich May 30, 1877. 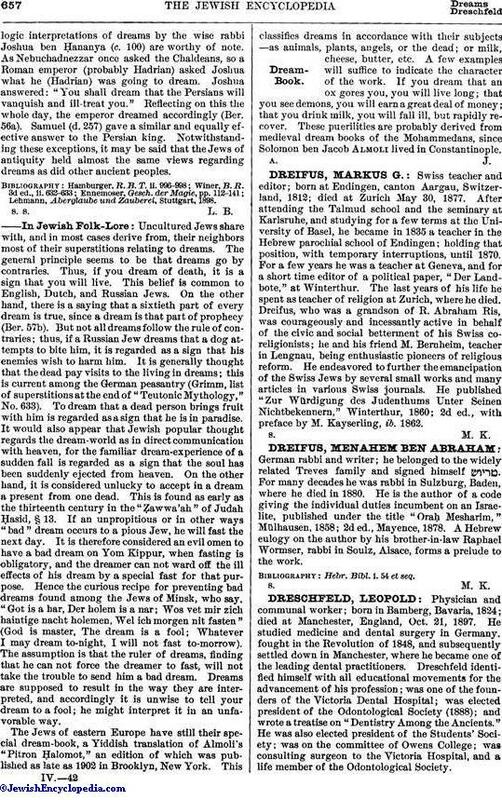 After attending the Talmud school and the seminary at Karlsruhe, and studying for a few terms at the University of Basel, he became in 1835 a teacher in the Hebrew parochial school of Endingen; holding that position, with temporary interruptions, until 1870. For a few years he was a teacher at Geneva, and for a short time editor of a political paper, "Der Landbote," at Winterthur. The last years of his life he spent as teacher of religion at Zurich, where he died. Dreifus, who was a grandson of R. Abraham Ris, was courageously and incessantly active in behalf of the civic and social betterment of his Swiss coreligionists; he and his friend M. Bernheim, teacher in Lengnau, being enthusiastic pioneers of religious reform. He endeavored to further the emancipation of the Swiss Jews by several small works and many articles in various Swiss journals. He published "Zur Würdigung des Judenthums Unter Seinen Nichtbekennern," Winterthur, 1860; 2d ed., with preface by M. Kayserling, ib. 1862.